People often ask us about geothermal heating, as there are many fantastical claims out there about how efficient it is, and how much money it can save you in utility expenses. The truth, in this case, comes in multiple parts. Indeed, geothermal heating system – installed correctly – can give you the most efficient heating arrangement that you can possibly get. Geothermal heating works, but it usually works by installing a network of pipes under the ground, thereby absorbing the heat under the ground, and bringing that heat inside, or doing the reverse when it’s in the cooling mode. The reason why it can be so efficient is this: the air-source heat pump exchanges the heat with the air outside, and the air could go down to a freezing level. However, underground remains relatively even in temperature, somewhere in the mid-50s Fahrenheit. So, there’s a lot more heat that you can extract out of the ground than you can pull out of other sources. The challenges, however, come in multiple forms. The first and the most problematic issue is that it is significantly more expensive to install a ground-source geothermal system as opposed to an air-source system. If you think about it, an air-source air conditioner just needs to be put next to a house, the piping connected to the furnace, a coil installed properly, some electrical wiring done, and the system is ready to go. 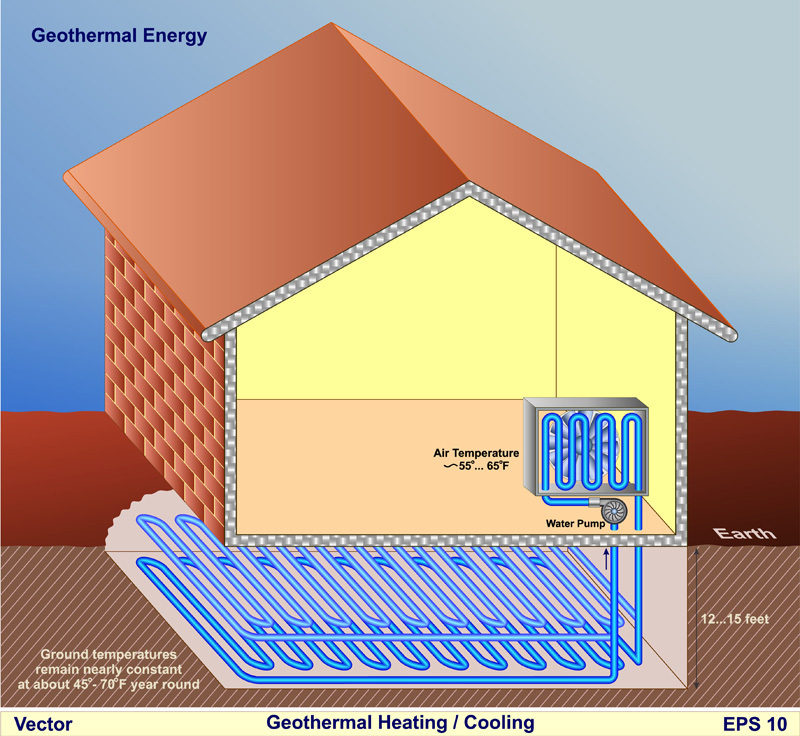 A ground-source system can take weeks to install, might involve a reconstruction of your entire property, including drilling of wells in the ground and many other major activities.The problem here is that geothermal heating systems drive up the installation and material costs to a very high level, which, unless you’re planning on being in the house for 40 or more years, makes it hardly a cost-effective solution; most probably you will never recoup the money that you spend in the process. Another negative aspect of geothermal heating, in our opinion, is the relatively minuscule number of people that know how to work on them. From my experience, I would estimate that for every 1000 technicians that can work on conventional heating or cooling systems, there may be 1 person who is qualified to work on a geothermal system. If you’ve ever had an issue at home that required fixing, you know how long you have to wait until the repair person shows up. Imagine the same situation, but there are 1000 times less specialists available. We’ve had to go in many times and disable a geothermal system, and put in a conventional system instead, because the clients were so frustrated with not having it working how they thought it was going to function. I think geothermal heating does have a bright future, but it is going to require the systems to be streamlined and simplified, and manufactured by the largest manufacturers in the world to drastically expand how many people service them, install them and work on them. It is a heating source of the future, but it will take many years until it becomes an economically feasible solution.